it’s no secret that i like to be pampered with good food and beautiful drinks. i can’t always afford it but i take full advantage of it when it’s offered. why wouldn’t i? wouldn’t you? of course you would. anyway. 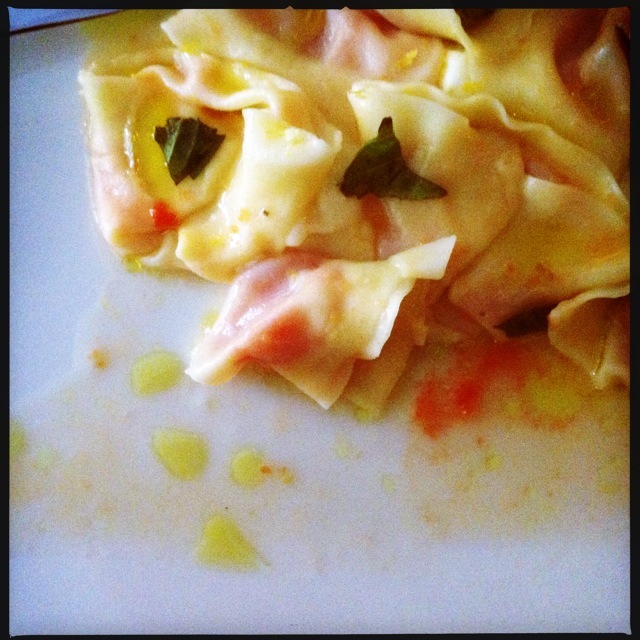 last week i went to a new spot (new to me, at any rate) – local kitchen and wine bar. it’s a cute little hole in the wall at roncesvalles and queen in toronto. when i say “hole in the wall”, it’s not really, but it’s very small. a one man kitchen working on a four stove burner (probably part of the hipster elite appeal). i wasn’t particularly fond of the single bathroom with the door opening on to the main counter but… you get what you get. aside… i love roncy, it’s full of little shops and boutique restaurants. and i’m dying to poke through all the antique stores surrounding local, their funky, vintage wares spill out onto the street, enticing even the most second-hand weary shoppers. back to local. an adorably hipster waitress sat us at a small wooden table and handed us mini clipboards with the menus and wine list attached. apparently we were supposed to lead with something from their carefully curated selection of sicilian wines, but i saw sangria on the chalk board and obvi, i had to go for that. 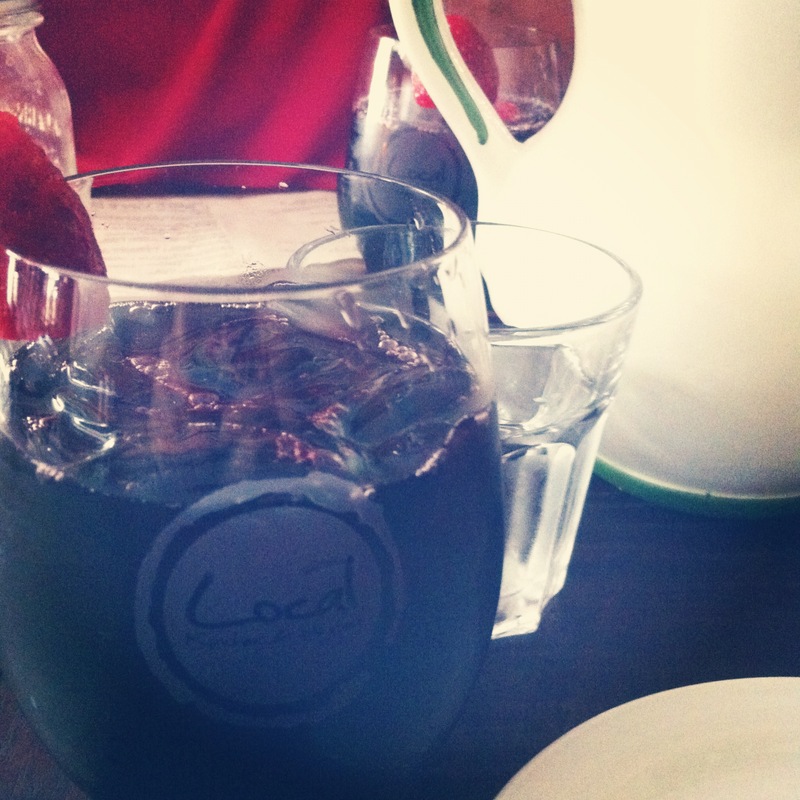 it was probably the best sangria i’ve tried. beautifully sweet and cool: strawberries, cherries, raspberries, with aperol and montepulciano d a’bruzzo. can you see how gorgeously dark it is in the picture above? 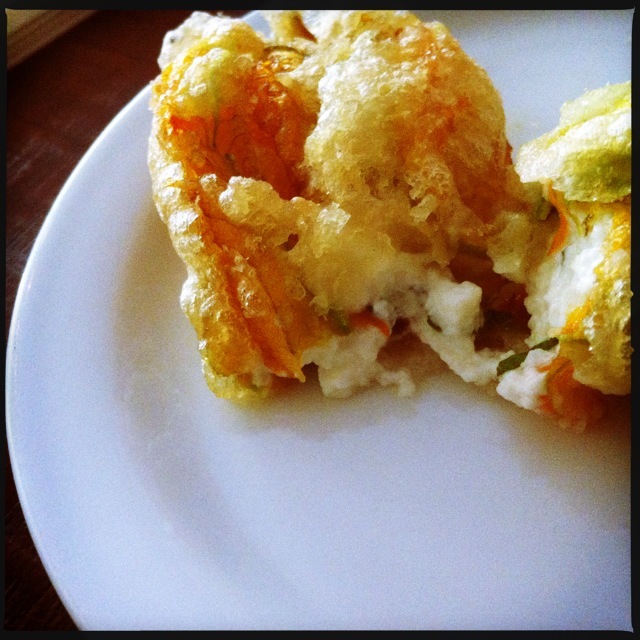 to start, because i’ve never tried them before, we had zucchini flowers stuffed with ricotta cheese, then battered and deep fried. i remember hearing long ago about how wonderful a zucchini flower can be, and have always been curious. um… hello? where have you been all my life? so delicately flavoured, i think i am in love. it also just underscores my strong feelings on deep frying. everything should be that. next, a capaletti di pomodoro on top of fresh buratta – in-house made pasta filled with like, a sweet tomato puree, with a lemon and basil oil, on top of fresh cheese that is practically butter. i thought, if i could eat this every day for the rest of my life, i would be set. seriously. to finish, a dark glass of ’08 nero d’avola from sicilia. the description – deep notes of amarena cherries from south italy. my take: a very aromatic wine, sort of woody on the nose. but there was something there i couldn’t quite put words to. strong and beautiful at the front of it, it was very cherry in the middle, and wistful at the end, begging “please, have another sip!” the flavour kind of lingers, waiting. i don’t know if you’re supposed to ascribe emotions and thoughts to wine but… i’d like to think that glass did.